As a gentle introduction to the serious business of my Fellowship, and whilst it still feels like I have left my brain behind somewhere, I’ve spent this afternoon at the Melbourne Museum. The visit was the result of a chance last-minute connection, but fitted into a theme I shall also be looking into at the Powerhouse Museum in Sydney and the Computer History Museum near San Francisco. One of the challenges for local archives in the UK will be to encourage digital deposits. Few digital preservation projects have addressed this issue (Paradigm is a notable exception), mostly because it isn’t really a problem where there is strong archival legislation or other sticks in place to encourage deposit (such as deposit being a requirement of research funding). Another problem is that potential depositors don’t seem to see computer-generated records as archives. For them, archives = old stuff, and computers = new stuff. At WYAS, I’ve been doing some research on the first computer purchased by the West Riding County Council in 1957 (see the photo in the blog header) as one possible way of addressing this problem, hoping that people will be interested and surprised to learn that computers have been around (even in local government!) for fifty years. Could we as archivists learn anything from the way in which the museums profession markets technology for a non-specialist audience? Is there anything we could take from this to hook in potential depositors of digital archives? Well, it turns out that the Museum Victoria (of which Melbourne Museum is a part) don’t display much of their historical technology collection! However, the CSIRAC, Australia’s first computer and the only complete first-generation computer still intact anywhere in the world, is on display. A (modern) computer program simulates the look and sound of the computer in action, and there is a short video showing reminiscences from those who worked with the computer, some fascinating contemporary footage, and even some music programmed on the CSIRAC. 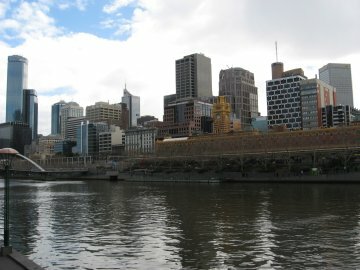 Melbourne’s Biggest Family Album is an example of what we in the UK would call ‘community archives’ and makes extensive use of Web 2.0 technologies. More relevant perhaps to the digital preservation topic, the Visitor’s Photo Album part of the online exhibition links to the Melbourne Museum group on Flickr and allows visitors to share their photographic experiences of the exhibition. I also had a tour of the museum looking at the way ICT is used in presenting the exhibits, and discussed how Web 2.0 tools can be used to promote usage of the collections, and even bring additional visitors into the museum. Melbourne Museum are experimenting with podcasts by the curators and staff blogs. We also discussed how social tagging can be used in conjunction with traditional collections management databases to encourage visitor engagement – see STEVE – The Museum Social Tagging Project for a wealth of research into the topic. I was also introduced to the Museum’s Archivist and Records Manager, and looked at how the Museum structures and manages its own administrative records, both paper and digital.